I begin this week with recipes dedicated to the Potato. In case you did not know the potato is native to South America. It is the nutritional base of millions and a culinary delight for major parts of the globe. There are about 24 different varieties of potatoes, the most widely used are the Yukon gold potato. It contains a lot of starch, vitamins, fiber needed to the daily diet. Is used in a variety of forms including alcoholic beverages. I recommend not keep in the refrigerator, it keeps well at room temperature, but just remember to consume it as soon as possible. Share with us this week full of recipes dedicated to this versatile vegetable and explore new ways to include it more often in the diet of your family. Place unpeeled potatoes in a bowl cover with enough water and cook in microwave for 25 minutes. When ready, drain the colander to remove water, place back into the bowl and cool completely. When the potatoes are cold peel carefully. 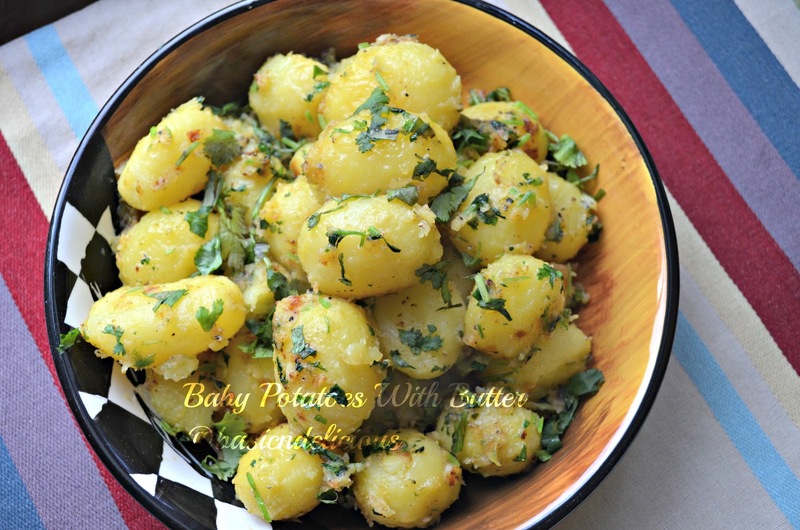 In a saucepan melt the butter add the potatoes and stir constantly until golden brown about 5 minutes. Remove from heat, add the garlic, cilantro, salt and pepper. Serve as an accompaniment to any meat. Iniciamos esta semana con recetas dedicadas a la Papa. Por si no lo sabia la papa es un tubérculo originario de America del Sur. Es la base alimentaria de millones de personas y una delicia culinaria para grandes partes del globo. Existen alrededor de 24 diferentes variedades de papas, las que mas gustan son las papas amarillas. Contiene una gran cantidad de almidón, vitaminas, fibra necesarios para la alimentación diaria. Es utilizada en una gran variedad de formas incluyendo bebidas alcohólicas. Le recomiendo no guardarla en la refrigeradora, se mantiene bien a temperatura ambiente, pero de igual forma recuerde consumirla lo antes posible. Comparta con nosotros esta semana llena de recetas dedicadas a este versátil tubérculo y explore nuevas formas usted también de incluirla mas seguido en la alimentación de su familia. Coloque las papas sin pelar en un tazón cubra con suficiente agua y cocine en el microondas por 25 minutos. Una vez listas, pase por el colador para eliminar el agua, coloque de nuevo en el tazon y enfrie completamente. Una vez frias retire la cascara con cuidado. En una olla derrita la mantequilla agregue las papas y mueva constantemente hasta que tomen un color dorado aproximadamente 5 minutos. Retire del fuego, agregue el ajo, el cilantro, sal y pimienta. Sirva como acompañamiento para cualquier carne. I am very excited to participate in this week’s recipe. This is a little twist to a super basic and simple recipe that kids and adults will really enjoy. In this very special #SundaySupper movement, I had the pleasure of interact with people very amazing. 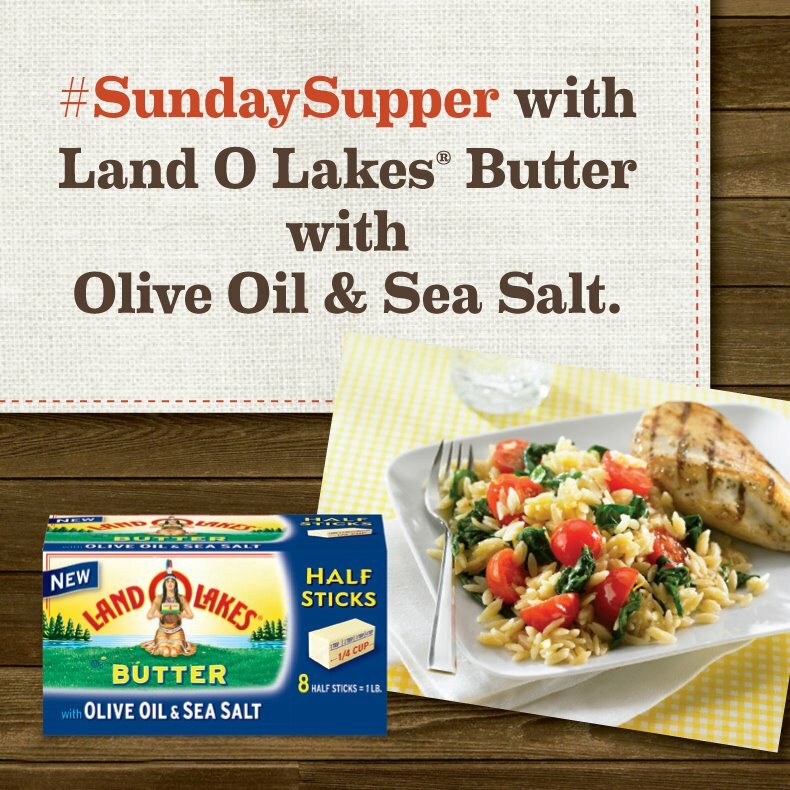 This week we are introducing LAND O LAKES® Butter with Olive Oil & Sea Salt. About LAND O LAKES® Butter with Olive Oil & Sea Salt Land O’Lakes is expanding its popular line of half-stick butter with the introduction of LAND O LAKES® Butter with Olive Oil & Sea Salt. This new product contains wholesome ingredients: sweet cream, olive oil and sea salt. LAND O LAKES® Butter with Olive Oil & Sea Salt is an easy and convenient way to simply enhance the flavor of your favorite foods. Available in a premeasured half-stick size, this new product can be used for topping and cooking a variety of foods, combining the two ingredients consumers often combine separately when frying or sautéing foods. The delicious taste of butter and olive oil will add delicious flavor to any dish. Disclosure: The author received a full-value coupon redeemable for LAND O LAKES® Butter with Olive Oil & Sea Salt, for recipe development and review purposes. They are adding a new and delicious flavor to their already large family of LAND O LAKES® Butter. I invite you to delight your senses with new recipes that we will bring this week. Cut and peel the potatoes into chunks. Place in a large bowl, cover with enough water and cook in microwave for 30 minutes. In a separate bowl with the butter add the basil, garlic, cheese and pepper, heat the half and half for 40 seconds and set aside. Once the potatoes are ready, drain in a colander and place the potatoes back in the bowl, mash with a fork or potato masher, add the above ingredients and mix well so that the mix is consistent. 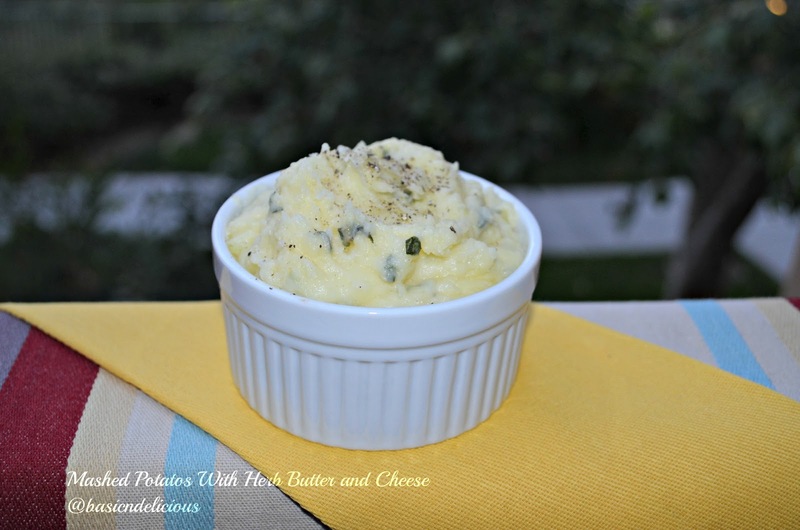 Make sure you check out this amazing #sundaysupper participants and see what they make with this delicious butter. Who said the this dish is hard to make? We can enjoy the best gourmet food at home without any complication. In a saucepan over low heat melt the butter and add the onion and red pepper. Once already softened, add garlic and shrimp let them cook until the shrimp take a pink color, immediately add the zest and lemon juice.